In our many years of providing assistance to bereaved families, we understand the importance of commemorating the life of a loved one. An appropriate monument can bring comfort as a visible tribute to the life that has been lived. Helping families to design and select monuments of real meaning and distinction is our honor and privilege. 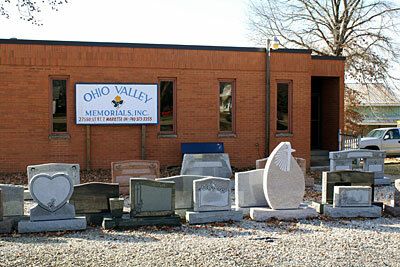 There are many different monument types and choices available, and with the current technology, Ohio Valley Memorials can offer you numerous options for personalization and creativity. Monuments are offered in a variety of granite types that are quarried in the USA, and from around the world, giving you an option of wide color and stone choices. We also offer bronze markers, vases, and porcelain pictures. Current technology allows many options for personalization. Laser etching and custom hand etching in black and white, or color, are available for you to customize or personalize your memorial with a picture or image of your choice. Please contact us and allow our experienced staff to help you choose the right tribute for your loved one.